HMSI (Honda Motorcycles and Scooters India) has announced the launch of Honda CBR150R at the Auto Expo 2012. They have revealed all the information, pictures and details of Honda CBR150R Bike At Auto Expo 2012.The official launch with price details is to happen in March 2012 in India. The Honda CBR150R is to be positioned at a price point lower than that of the Honda CBR 250 which is the elder sibling of the 150R. The launch is more interesting now as since the revealing of the 150R at the Auto Expo 2012, Bajaj and KTM have lunched the KTM Duke 200 and the Bajaj Pulsar 200 NS launch in India is also around the corner. The sports bike segment is getting hotter day by day and the entry of sub Rs. 1.2 Lakhs bikes in this segment is really challenging for the Yamaha R15 which till recently used to be the only choice in this segment. As per the media sources, the Honda CRB150R will be priced at Rs. 1.15 Lakhs in India which is very close to the pricing of KTM Duke 200 and slightly higher than Yamaha R15 Version 2.0 which was launched in India in August 2011. In this article, we bring you a detailed comparison among the three legendary sports bike in India which are priced between Rs. 1.0 Lakhs and Rs. 1.2 Lakhs. 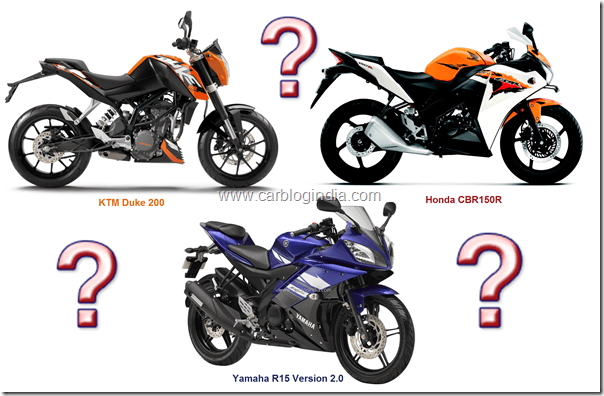 – The Honda CBR 150R VS Yamaha R15 Version 2.0 Vs KTM Duke 200, read of the details below. Considering the power and torque specifications, the Honda CBR150R lies in between the R15 and Duke 200. The R15 produces 16.8 BHP Power and 15 Nm or torque, the CBR 150 Produces 18 BHP of power and 12.6 Nm of torque while the mightiest of the the three, Duke 200 produces 24.7 BHP of power and 19 Nm of torque. In terms of performance and handling characteristics, all three bikes are very sporty in character and are well handling bikes. In terms of styling, both Yamaha R15 and CBR150R are fully fared bikes with more sporty looks while the Duke 200 is a naked sports bike with low body weight and high power to weight ratio. The weight distribution is also very well sorted out in all three of these bikes. All three feature disk brakes at front and rear, however the disk size of the Duke 200 is largest among three. All three feature monoshock suspension at rear and telescopic hydraulic suspension at front, but the duke has large (43 mm dia) inverted telescopic suspension for improved stability. 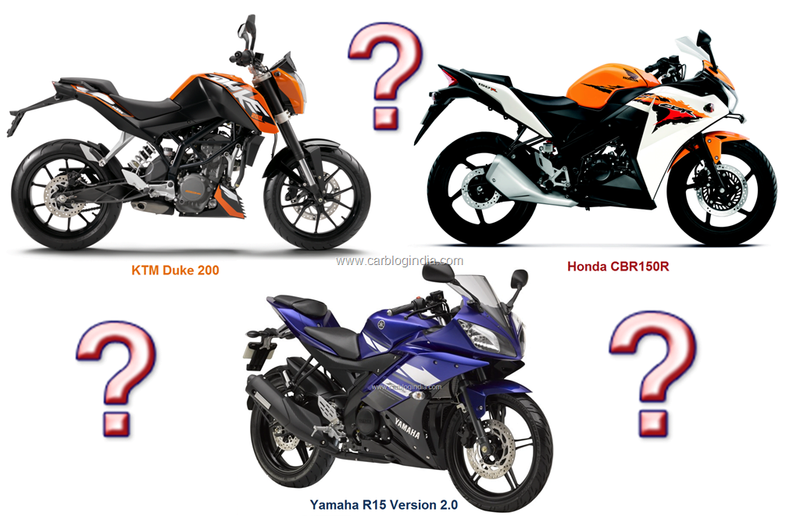 Out of the three, the Duke looks more of an off-roader with its large suspensions travels, naked appeal, while the R15 and CBR150R look more like race track machines. If you want a more adventurous looking bike the KTM is the machine to look for, and if you want a more sophisticated racing looks, the CBR150 R and R15 look good. The R15 besides being there for many years, still looks very fresh and attractive. The CBR150R is more race track like, but lacks the sophistication that R15 reflects. The KTM Duke 200 on the other hand is like a rebellious look which has a personality of its own which seems to please the youth very well. All three bikes have well sorted out engines with fuel injection technology. The R15 has a 150 CC liquid cooled engine with fuel injection and digital ignition system. The engine revs high and delivers peak power of 16.8 BHP at 8500 RPM and high torque of 15 Nm @ 7500 RPM. It is mated to a 6 speed manual transmission gearbox. The Honda CBR150R has a 150 CC engine which is also liquid cooled. It delivers peak power of 18 BHP @ 10500 RPM and peal torque of 12.6 Nm @ 7500 RPM. It also features a 6 speed manual gearbox. The KTM Duke comes with a larger 200 CC liquid cooled engine with 24.7 BHP of power at 10000 RPM and 19 Nm of torque at 8000 RPM. The duke 200 also comes with manual 6 speed gearbox. If we compare these three engines, the R15 delivers peak torque and peak power at comparatively lower RPM levels. In fact the R15 delivers better torque compared to CBR150R at similar RPM levels. Since Honda is very well known for its super smooth happy revving engines with good fuel economy, Honda CBR150R engine is probably tuned for higher fuel economy compared to the R15 engine. Among these three, the Duke 200 engine is most powerful and delivers more torque as it’s a higher displacement engine. Since there is no faring and components are quite light weight on the Duke 200, it has the best power to torque ratio in the segment. If you want a sophisticated looking bike with tried and tested road records, the R15 is the bike to go for, however it does seem pricey when compared to the performance delivered by Duke at some extra bucks, but it’s a naked bike, so no faring and sophisticated racing looks there. If you want a super smooth Honda Engine with good balance between style, power and fuel economy, the Honda CBR150R is the bike to go for. It has good good looks, good power and an overall value for money package. If the power and adventure is your main criterion and you don’t bother much about the body faring, the KRM Duke 200 is the most powerful machine and most adventurous ride you can go for in its price segment. If I were to pick, I would probably go with a Duke 200.